Are you looking to upgrade your home security? One of the best investments you can make in your home is an upgrade to a smart lock. By purchasing and installing a smart lock for your door, you will be able to gain specific advantages that can not only boost the level of convenience that you are able to enjoy but also security features. Below, we will be going over more in our smart lock buying guide. Smart Lock Buying Guide – Why Would You Want One? 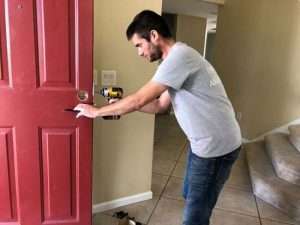 While your traditional deadbolt likely locks your door perfectly fine and serves its purpose, you gain certain advantages with the installation of a smart lock that you simply couldn’t get with a traditional deadbolt lock. 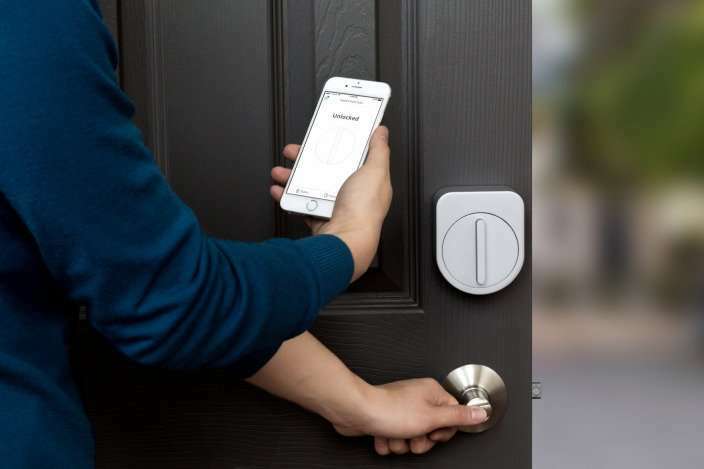 Smart locks can provide you with all kinds of advantages that you wouldn’t be able to get with a traditional lock such as the peace of mind knowing whether you locked your doors on your way out right before a big trip. With smart locks installed, checking to see whether or not your doors are locked is as simple as opening up and checking an app. Also, you will be in complete control over your locks at all times having the ability to go into your settings and lock your door from virtually anywhere. These reasons have been enough for many consumers to jump onto the smart lock bandwagon. If you decided that smart locks are something that you want to invest in, you will want to be sure to purchase the right option for your needs. Below, we will be going over more details on what you should be considering when shopping for one. The best way to go about switching to a smart lock is with a complete replacement. This is typically what you will want to do when you are looking to switch to a smart lock because it is going to provide you with a lot more options to choose from on the marketplace and it is going to allow you to get fully featured options. There is no worrying about compatibility requirements or anything else. Also, when opting for complete replacements, you will be able to get a streamlined installation that is going to be relatively easy even for the novice. However, you do have the option to go with a retrofit method. There are manufacturers on the market that do make retrofitting options that essentially clamp in place on top of your existing deadbolt lock which will allow you to gain some of the features of a smart lock without requiring significant installation. However, you do have to worry about whether or not your existing deadbolt is compatible with the smart lock system of your choosing. Also, you will have limited options to choose from which makes it better to simply opt for a complete replacement solution. Once you have decided on the option you are going with, you are going to want to pick the protocol that you will want the smart lock to utilize. There are three primary wireless protocols that you can choose from on the marketplace including Wi-Fi, Bluetooth, and Z-Wave. Each comes with its own set of pros and cons. For Bluetooth, you are going to be able to gain a better overall battery life. However, you will have a much more limited range with Bluetooth. Whereas, with Wi-Fi, you are certainly going to chew through your battery life at a greater pace, but it is going to offer you the greatest range. With Z-Wave technology, you are going to need to have a compatible hub that the lock connects to and it will work up to around 120 feet in total. Therefore, you are still going to have limitations. With that being said, you do have the option to invest in more Z-Wave devices which can act sort of like Wi-Fi repeaters and extend the range for you if needed. 3. Features and Third-Party Compatibility. Another big thing that you are going to want to consider when shopping for the right smart lock would be the different features that you want and how you plan on interacting with the smart locks. There are different options on the market that will have you utilize an application, some will provide you with touch pads, and some will allow you to do it with your key. You want to figure out the features that you are looking for and what kind of third-party integration you are after (if any). By following the tips above, you should be in a great position to find the right smart locks for your home.